Distraction from God is extremely dangerous. As believers we believe that God is the captain of our ship. When you start losing sight of your captain, you start trying to steer your own ship. Not only does this lead to going the wrong way, but it can lead you in the direction of trials, sin, missed opportunities, and missed blessings. When you lose sight of your captain you start to fear and worry. You start to think I’m in this by myself. Your captain promised to guide you and help you but instead of focusing on Him you started focusing on the huge waves and the other sailors around you. As technology advances being distracted from God is becoming easier and easier. Distraction from God could be because of sin, but that’s not always the reason. The main reason is life and getting caught up in the world. Reasons for distractions include ourselves, money, hobbies, relationships, cell phones, TV, and more. Sometimes we’re consumed with our technology all day and we only acknowledge God right before we go to sleep with a quick 20 second prayer and this should not be. The quick prayer we did was a selfish one at that and we didn’t even take the time to say thanks and give Him praise. In life we’re supposed to do God’s will not our will. When we allow other things to consume our lives we drift away from God. Fix your eyes back on the captain. You know where to find Him. Satan always tries his best to distract us and when we get serious about having fellowship with the Lord he will try to distract you even more. Don’t be afraid. God says, “draw near to me and I will draw near to you.” Keep praying. Many times people pray, but then get distracted and think it’s not going to work. Stay focused on the captain. Spend time with your Lord like you would with your child or parent. Know that He is with you on the journey. He’s guiding you to the right place. If you persevere in prayer, at the right time He will answer. Have faith! 1. 1 Corinthians 7:35 I am saying this for your benefit, not to place restrictions on you. I want you to do whatever will help you serve the Lord best, with as few distractions as possible. 2. Mark 4:19 but all too quickly the message is crowded out by the worries of this life, the lure of wealth, and the desire for other things, so no fruit is produced. 3. Luke 8:7 Other seed fell among thorns that grew up with it and choked out the tender plants. 4. 1 Corinthians 10:13 No temptation has overtaken you that is unusual for human beings. But God is faithful, and he will not allow you to be tempted beyond your strength. Instead, along with the temptation he will also provide a way out, so that you may be able to endure it. Being distracted from God by the world. 5. Romans 12:2 Do not be conformed to this world, but be transformed by the renewal of your mind, that by testing you may discern what is the will of God, what is good and acceptable and perfect. 6. 1 John 2:15 Do not love the world or the things in the world. If anyone loves the world, the love of the Father is not in him. We must stay focused on Christ. 7. Hebrews 12:2 fixing our attention on Jesus, the pioneer and perfecter of the faith, who, in view of the joy set before him, endured the cross, disregarding its shame, and has sat down at the right hand of the throne of God. 8. Colossians 3:1-2 If ye then be risen with Christ, seek those things which are above, where Christ sitteth on the right hand of God. Set your affection on things above, not on things on the earth. 9. Proverbs 4:25 Look straight ahead, and fix your eyes on what lies before you. 10. Isaiah 45:22 Let all the world look to me for salvation! For I am God; there is no other. The dangers of taking your eyes off of Christ. Peter got distracted by everything around him. We should follow the example of Mary instead of Martha. Satan seeks to distract us in any way possible. 14. James 4:7 So submit to God. But resist the devil and he will flee from you. Sometimes we must stop everything and go to a quiet place to hear God. 15. Mark 6:31 Then Jesus said, “Let’s go off by ourselves to a quiet place and rest awhile.” He said this because there were so many people coming and going that Jesus and his apostles didn’t even have time to eat. We must prioritize our time. There must be a time for prayer daily. 16. Ephesians 5:15-16 So, then, be careful how you live. Do not be unwise but wise, making the best use of your time because the times are evil. 17. Mark 1:35 And in the morning, rising up a great while before day, he went out, and departed into a solitary place, and there prayed. Being distracted by the worries of life. 19. Matthew 6:31-33 “So don’t ever worry by saying, ‘What are we going to eat?’ or ‘What are we going to drink?’ or ‘What are we going to wear?’ because it is the unbelievers who are eager for all those things. Surely your heavenly Father knows that you need all of them! But first be concerned about God’s kingdom and his righteousness, and all of these things will be provided for you as well. We can even get distracted by doing things for God that we lose our zeal for the Lord. Doing things for Him and getting distracted by Christian projects can cause us to stop spending time with God in prayer. 20. Revelation 2:3-4 You also possess endurance and have tolerated many things because of My name and have not grown weary. But I have this against you: You have abandoned the love you had at first. Focus on the Lord by meditating on Scripture. 21. Joshua 1:8 “This book of the law shall not depart from your mouth, but you shall meditate on it day and night, so that you may be careful to do according to all that is written in it; for then you will make your way prosperous, and then you will have success. 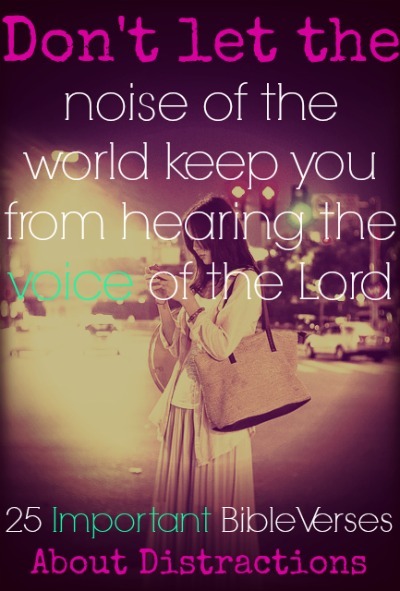 We must never let others distract us from the Lord. 22. Galatians 1:10 Am I now trying to win the approval of human beings, or of God? Or am I trying to please people? If I were still trying to please people, I would not be a servant of Christ. 23. Ephesians 6:11 Clothe yourselves with the full armor of God so that you may be able to stand against the schemes of the devil. 24. Proverbs 3:6 think about Him in all your ways, and He will guide you on the right paths. 25. 1 John 5:21 Little children, keep yourselves from idols.